A new study shows microphones suspended from helium balloons in the stratosphere can detect low-frequency sounds from ocean waves. The new method shows promise for detecting acoustic signals from natural disasters and nuclear explosions that cannot always be reliably detected by sensors on the ground, according to the study's authors. Infrasound, sounds with frequencies below 20 Hertz, are too low for humans to hear, but come from many sources, including air conditioning units, natural disasters, thunderstorms and whale or elephant vocalizations. Scientists can use infrasound sensors on the ground to pinpoint the location and size of avalanches, meteorite strikes and nuclear explosions, among other events. But networks of infrasound microphones on the ground often experience interference from wind and human sources like nearby machinery, dams or bridges, making it difficult to accurately detect faint infrasound signals from faraway sources. The new study's results show sensors in the stratosphere may reliably detect infrasound signals without this interference. This could help scientists better detect the origin of infrasound signals, according to the study's authors. "With a sensor on the ground, the wind is blowing past and creating turbulence and causing distortion, but when you're being pushed by the wind, that doesn't create any noise at all since you're traveling at the same speed as the air around you," said Daniel Bowman, a geophysicist at Sandia National Laboratories in Albuquerque, New Mexico, and lead author of the new study in the Journal of Geophysical Research: Atmospheres, a journal of the American Geophysical Union. "Even if you do get a wind gust, the air in the stratosphere is about 100 times less dense, so the force that it imposes is much less. Those two things combined basically eradicate [wind] noise in the stratosphere, as far as we can tell." In the late 1940s, the U.S. government attempted to use balloon-borne sensors to monitor nuclear testing and ballistic missile launches during Project Mogul. This project is more widely known as the origin of the Roswell Incident, in which balloon debris was initially thought to be the result of a UFO crash. In the early 1960s, a scientist at the University of Michigan carried out multiple balloon flights to measure how much infrasound could be heard from the stratosphere, but these results are not well documented. Little to no research had been done on balloon-borne infrasound sensors since then, according to Bowman. 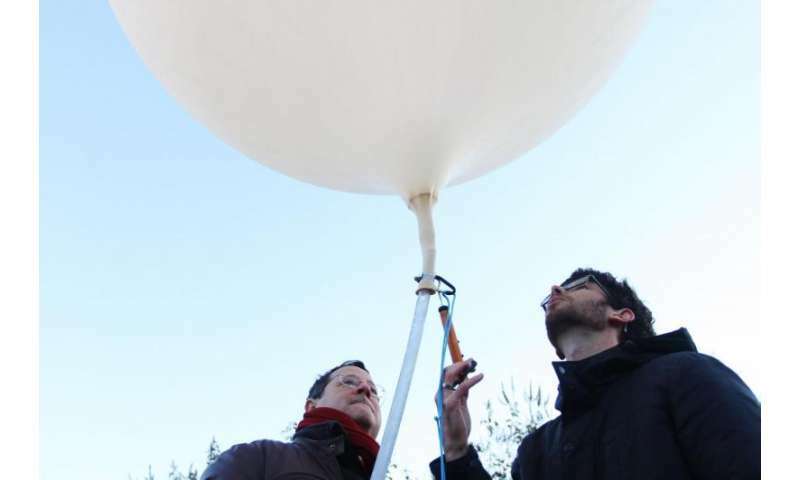 "There was 50 years of nothing, and in 2014, my advisor and I put a microphone on a balloon out in New Mexico as a part of a student project and began recording infrasound from this environment," Bowman said. "We belatedly realized that we were really the first to do it in quite a while." In the new study, Bowman and his colleagues contributed infrasound payloads to the NASA High Altitude Student Platform (HASP), a yearly program that gives student teams the opportunity to perform experiments on long-duration flights in the stratosphere. During the 2014-2015 flights over Arizona and New Mexico, in which HASP balloons were outfitted with microphones, they detected microbarom signals in the stratosphere for the first time, Bowman said. The study's authors compared microbaroms detected by their stratospheric sensors to signals from ground-based sensors. They found the stratospheric sensors could detect additional microbaroms and picked up less background noise than ground sensors. While the new study only examined the recordings from a handful of flights, the results indicate balloon-borne sensors are a promising method for detecting other infrasound, like those from natural disasters or nuclear explosions, Bowman said. The detectors could be used to monitor infrasound generated by nuclear weapons and could help enforce nuclear weapons bans, Bowman said. 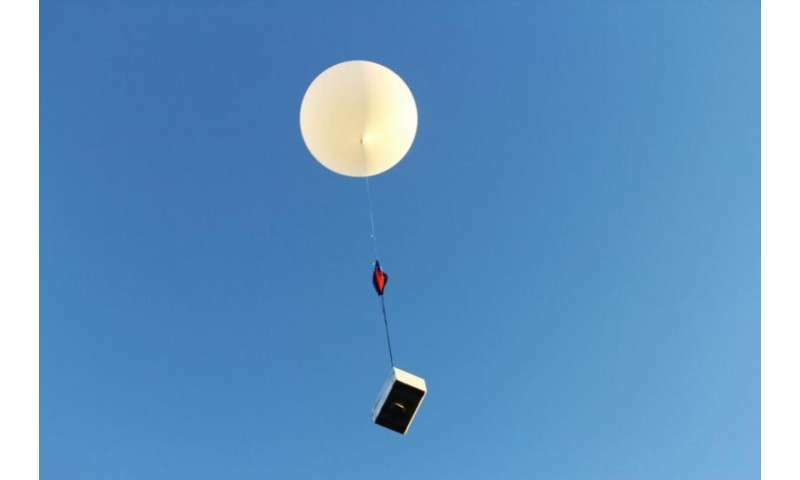 Balloon-borne infrasound sensors could also be used to detect infrasound in a gaseous planet's atmosphere that could help scientists learn about that planet's interior and phenomena in the atmosphere such as meteor strikes and thunder, Bowman said. Further research is needed to improve the airborne sensors, Bowman said. Researchers must carefully choose the altitude and time of year for the balloon's flight to help ensure it travels over the desired area. Because the detectors move with the wind, researchers can only tell whether the sound is coming from above or below the sensor, and can't determine the exact direction an infrasound is coming from. While more research is necessary to help resolve some of these issues, Bowman said the initial flights discussed in the new paper indicate the method has potential for further development. "We'll never replace ground networks, but I think we can greatly augment them," Bowman said. "I also think this really brings the possibility of planetary acoustics to realization, which is extremely exciting. I think we're going to see some really exciting stuff in the future."